Aviator and artist Harold Hume Piffard, known as Piff to his friends, was born in India and educated on the South coast of England. He exhibited four works at the Royal Academy, two works at the Royal Society of Artists in Birmingham, and several works at Liverpool. Piffard finished his schooling in England in 1883 and returned to India to work briefly on a Darjeeling tea plantation. Still unsure where he wanted to focus his creative energy, he decided to join an acrobatic troop. In 1889, after few years of exploring possible careers paths, he went back to India to focus on his painting. He eventually entered the Royal Academy of Arts and later spent some time studying in Paris. He became a successful portrait painter and skilled history painter. His well-known painting depicting the capture of the Spanish City of Zaragoza during the Peninsular War (Saragossa: 10 February, 1809) details the brutality suffered by the Spanish at the hands of the French army. 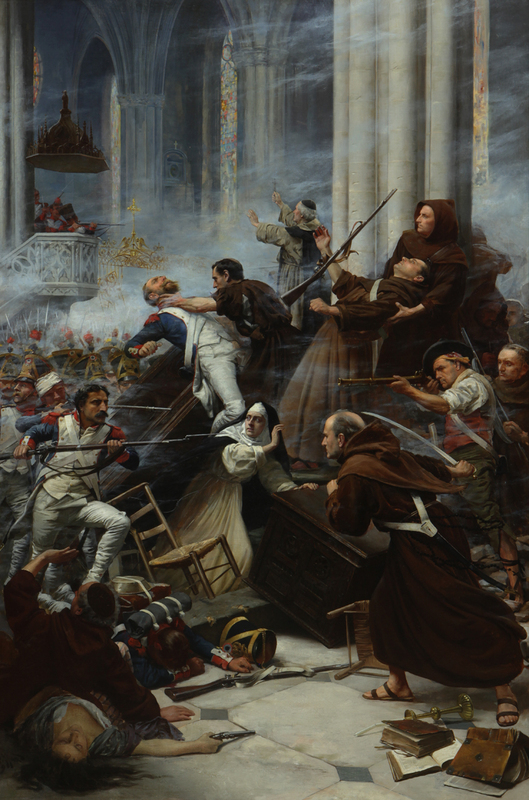 It is a vivid image of a cathedral under siege; gun smoke fills the interior of the church as French soldiers trample Spanish monks to the floor. A man of many interests and talents, Piff was fascinated with designing and constructing model airplanes. He established The Aviators Finance Company Limited and built a box kite bi-plane, which he named Hummingbird. Saragossa or Zaragoza is a city in Spain. Saragossa resisted fiercely in the Peninsula War (1807-14), a prolonged war fought in Spain and Portugal. The Second Siege of Zaragoza ended with the French capture of the Spanish city. It was particularly noted for its brutality.The Spanish did not rise up against Napoleon until he deposed their king, and put his own brother on the Spanish throne. This occurred shortly after the French invaded Spain on the pretext of conquering Portugal, but took over numerous Spanish fortifications in the processes. This caused a widespread rebellion, not among the aristocracy, but among common people throughout Spain. Here we see a cathedral under siege – gun smoke fills the church as French soldiers trample Spanish monks to the floor and monks wrap their hands around their attackers’ throats. Saragossa resisted to the bitter end, but the French prevailed.